Who would have ever predicted that at the end of the year, the two companies / movies that would find themselves being the most successful were Netflix and Aquaman? That’s right. Original movies on the streaming service had a greater financial intake (according to what Netflix is telling us themselves,) than many movies released in theaters. In the case of Netflix it was a one-two punch of two films released to immediate streaming success. Those movies were Bird Box and Roma. 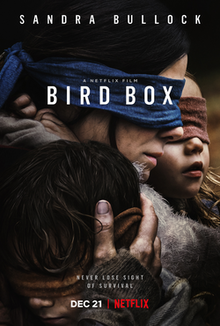 Bird Box was the Sandra Bullock film that came out of nowhere to be the most talked about movie of the Winter Vacation. Released right around Christmastime, this movie played on TV sets all across the country during that cold long week between Christmas and New Years. It was a week of people wanting to stay indoors in the comfort of their own homes, while still watching something new that everyone was talking about. Netflix gambled on that week and it paid off. Big time. And with Roma, what we were given was an artistic, Oscar caliber movie that most likely will hit it big when the nominations and awards come out at the end of the month. And it was released right to streaming (it also got a theatrical release, but that was just so it could qualify for the awards.) So unlike two years ago, (or the way it’s always been,) where movie lovers had to find small, obscure theaters to go to see art house, Oscar movies like Manchester By The Sea, now the movies were coming to the people. Right to their own homes. The approach worked. This holiday season, between those two movies as well as everything else they have going on, Netflix really did have something for everyone, ( They even dropped Avengers: Infinity War onto its streaming service during that week.) But they weren’t the only ones cleaning up at the movies. But audiences spoke up about quality. 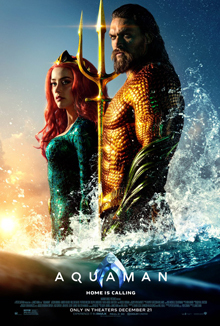 Not that these superhero movies have to be terrific, (I haven’t seen Aquaman yet, but I’m guessing it is something like Venom, which is to say B movie, guilty pleasure fun.) And so Spider-Man: Into The Spiderverse captured audience’s attention (as well as critics’) at the start of the month, and Aquaman got the attention and box office success at the end of the month. And let’s not forget that Marvel started streaming Avengers: Infinity War on Netflix (the same week that Aquaman came out in theaters.) If there was a such thing as over-saturating the market, this was it, and yet still, the audiences showed up. With A Star Is Born and Bohemian Rhapsody, it was about the performances as much as it was about the movies themselves. And both featured knockout performances. Rami Mallick portraying Freddie Mercury of Queen, was superb. And In A Star Is Born, both Bradley Cooper and Lady Gaga were sensational. If neither one of these movies ends up winning best picture, at the very least, one of them will take home the best actor trophy. And they were both all around, pretty powerful and gripping films. And there you have it. A season of twos. Bird Box and Roma (both Netflix movies that went right to streaming,) Aquaman and Spider-Man: Into the Spiderverse, (both superhero movies,) and A Star is Born and Bohemian Rhapsody, (both musical concert movies featuring amazing performances.) What an impressive and surprising movie season it was.